Today's vehicles are some of the most technologically advanced machines ever produced. Even an oil change isn't as basic as it used to be. 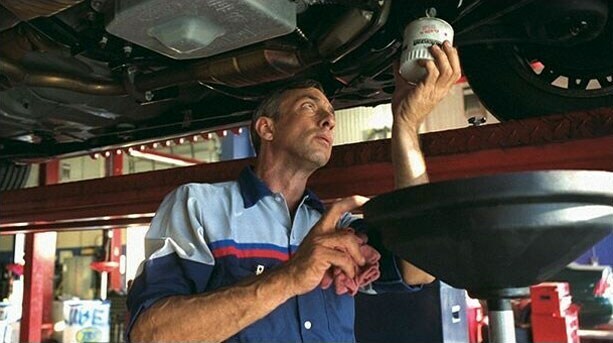 Our expert Ford Service techs know their stuff and have the right parts to help make sure the job gets done right. Why it's important to get your oil changed at regular intervals. You want to maintain your vehicle and keep it in great shape. Regular oil and filter changes help your vehicle run with optimum efficiency. When you use the proper grade of engine oil, you can improve your mpg by as much as 2 percent*. The right oil change at the right time. Everyone drives differently, but be assured: we know your vehicle. And we can help maintain it at the appropriate intervals. It's not as frequent as you think, so we can help save you time. In fact, with certain vehicles, you can go 10,000 miles in between oil changes. For 2008 and newer model year vehicles, Ford recommends that you change your oil every 7,500 miles or every six months, whichever comes first. For 2007 and older model-year vehicles, Ford recommends an oil change every 5,000 miles or every six months, whichever comes first. You can also check Intelligent Oil Life Monitor located in your vehicle's instrument cluster message center. The Works: An oil change and much more. When you visit Anderson Ford of Grand Island, we'll make sure your vehicle is checked properly with The Works. Our complete vehicle checkup includes a synthetic blend oil change, tire rotation and pressure check, brake inspection, Multi-Point Inspection, fluid-top off, battery test, filter check plus belts, hoses check, and more. Call Anderson Ford of Grand Island, consult your Ford Owner's manual, or go to Anderson Ford of Grand Island service scheduler. Want to know when it's time for an oil change? Take a look at the Intelligent Oil-Life Monitor, found in your vehicle's instrument cluster message center.